*Some of the exhibits will be changed in the second session. Lafcadio Hearn was born to Rosa Kasimati on the island of Lefkada, Greece, on June 27, 1850. His father was Charles Hearn from Ireland. Separated from his parents at an early age, he spent his childhood in Ireland. After traveling to the four corners of the earth, he eventually reached Japan and settled here. 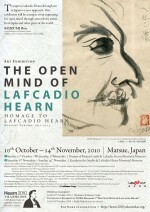 Hearn viewed Japan from his own unique perspective and grew to love and understand the country. He had an open mind, free from racial or religious prejudice. In this modern world, we should appreciate and understand his ideals and learn how to share his attitude. Matsue was one of the cities Koizumi Yakumo (Lafcadio Hearn) loved most. This year, the city of Matsue is commemorating the 160th anniversary of his birth and the 120th anniversary of his arrival in Japan and Matsue. 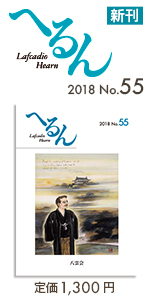 On this special occasion, ‘Yakumo’s world and spirituality’ will be expressed through an international art exhibition to be held at Matsue Castle, and by an exhibition of Lafcadio’s works and letters at the nearby Koizumi Yakumo Memorial Museum. 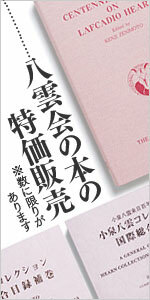 To express Koizumi Yakumo through art is a new approach. Last October, visitors and artists alike were inspired by the works by 47 artists from seven countries on display at the Hearn Art Exhibition at the American College of Greece in Athens. 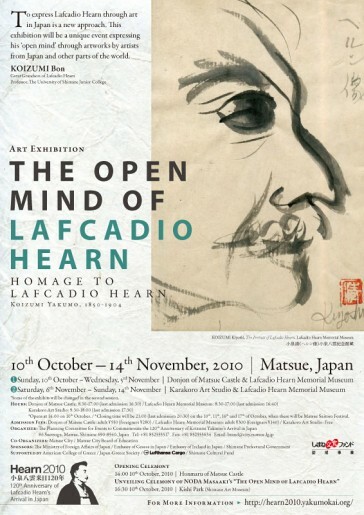 This year’s exhibition will be a unique event in Japan, celebrating his open mind through artworks by artists from Japan and other parts of the world. Since we are celebrating the 120th anniversary of his arrival in Japan, it is timely that we reevaluate his open mind with appreciation and respect. *Opens at 14:00 on 10th October. *Closing time will be 21:00 (last admission 20:30) on the 10th, 11th, 16th and 17th of October, when there will be Matsue Suitoro Festival. This event, primarily organized by Matsue Shinji-ko Rotary Club, will be held during the same period as the exhibition in Matsue Castle. Mr. Masaaki Noda, the artist who created the monuments to Lafcadio Hearn, will lead a workshop, in which he will teach the participating children how to express their feelings through artwork. Their work will be exhibited. Copyright © 2009- The Hearn Society (八雲会), all rights reserved.